A precious delight, the apple. One would think that in the Pacific Northwest, a major home to apple growers, home-growing apples would be the easiest thing of all, but it’s just the opposite: with apple-growing so prevalent in the region, every imaginable apple problem—from diseases to pests—is rampant. Several regional internet posters report that, even when all other fruit trees do wonderfully well, apples need spraying and other major defensive measures. Still, the homestead we occupied till a few years ago, just a mile down the road from where we are now, had apple trees of many years’ standing out in the orchard and they seemed to be doing tolerably well with no material help. It doesn’t take many trees to keep even the most avid apple fancier happy. A mature, healthy semi-dwarf apple tree may produce 6 to 10 bushels of apples; a bushel is 42 pounds, so with two trees we’re talking about 500 to 850 pounds of apples a year from two semi-dwarfs. Apples can be kept for a period that varies with the cultivar, as noted farther below. For optimum long-term storage, apples should be held near but definitely above freezing (say perhaps 34°F) and in 90% - 95% humidity. For small quantities, a refrigerator is satisfactory, so long as you don’t put any other vegetables or fruits in it. Note that stored apples (like most tree fruit) give off ethylene gas, which can have a marked adverse effect on many vegetables; so, if you “root cellar” fruits and vegetables, keep your apples (and any other tree fruit) very well away from any stored vegetables, especially potatoes. Never store any apples that are not perfectly blemish-free, and wrap each stored apple individually (newspaper is fine so long as you avoid any printing in color, as colored inks have toxic contents). Review of the literature makes clear that apple problems are of two basic and distinct classes: diseases and pests. In this region, both require extensive control measures (though it’s not so bad here on “the dryside” of the state as it is on the “rainyside”, the coastal I-5 corridor area). Fortunately, half the problem can be solved just by cultivar choice: there are now numerous thoroughly disease-resistant apple types available; while many of those have less than perfect flavor, not a few are said to have excellent taste. Pests, however, one still has to control for—though it is said that even organic methods, used with care, will suffice. Powdery mildew: a fungus, thrives in warm, dry climates, and so is our Public Apple Enemy #1. Scab: another fungus, thrives in moist climates, so that we in the dry interior don’t see it much. Fireblight: a bacterial infection, is fortunately not rampant hereabouts, though it tends to manifest in particularly hot summers. No apple-tree types are particularly resistant to pests, but the home grower can deal with them in several ways. One is sprays; and yes, there are “organic” sprays that are reasonable effective. Another, silly as it may sound to those first encountering it, is to literally bag each apple as it developes on the tree; that practice arose in Japan, but is now widely used, and is (it says here) not as tedious as it sounds if done on an ongoing basis. (One source said that once you get the hang of it, you can bag four apples a minute, and could thus do a whole home-orchard tree in half an hour to an hour at most.) One can get specially designed plastic bags, or use ordinary brown kraft-paper bags and staple them shut, or even use “zip-lock” bags. While every home grower has to evaluate the exact situation the tree will face in growing, it looks to us, from the literature, that the optimum choice in our environment—relatively shallow soil (circa 3-foot depth), mediocre clay soil, hot, dry summers, backyard “orchard”—is either the “Geneva 11” (aka just “G 11”), developed at the New York Agricultural Experimental Station in Geneva, NY (which has given North Americans a number of excellent rootstocks), or the “Budagovsky 9” (usually just as “Bud 9”), from eastern Europe. The two produce trees of approximately the same size—the Bud 9 might be a hair larger on average, but not lots. Understand that these rootstocks will produce fairly small trees—published figures are inconsistent, but 6 to 8 feet tall is probably about right; on the other hand, recall that larger trees are usually much slower to develop, often taking half a decade to produce their first usable fruit, whereas the smaller types can start usefully fruiting as early as their second year. (They also have shorter lifetimes, on the order of 15 years or so.) Be aware also that these smaller trees absolutely, positively require a support pole, and that means a big, solid one put in right at the outset (see details farther below). As to which of the two to go for, it will probably depend more than anything else on what your selected orchardist offers; if they offer both, get their advice about it (another reason it is especially wise to deal locally when buying live plants). The “M-series” rootstocks still in common use were developed at Malling, in the U.K., and are excellent for European growing conditions, but not as well suited to cold-winter North American climates as the native G-series rootstocks. For gardeners wanting, and having the space for, larger trees, the Geneva 30—aka just G 30—rootstock (a superior replacement for the M7 sort) looks like a good choice; it will produce trees something like 20% larger than the two cited above, and they will probably not need staking (unless perhaps you, like us, are in an area of occasional very high winds), though they may take an extra year or two to reach production. Another important consideration in selecting apple types is pollination. Most apple cultivars are nominally self-pollinating, but—as with virtually all fruit—they will normally produce better when cross-pollinated. That means more than simply planting two or more varieties: it means planting multiple varities that all blossom at roughly the same time, else there cannot be cross-pollination. Apples are commonly divided, in an inexact but sufficient way, into “early”, “mid-season”, and “late” varieties; optimum cross-pollination is assured from types of the same period, but from the literature it appears that anything except early-late combinations should cross-pollinate satisfactorily. When considering earliness vs. lateness, keep in mind that early apples are—with some notable exceptions—less flavorsome, and also much shorter keepers, their post-harvest usefulness being better expressed in weeks than months. As a rough rule of thumb, the later the apple, the longer it is likely to keep, with some sorts being good for up to 7 months in proper storage. On the other hand, a cultivar that ripens too late for your region will not produce satisfactory fruit. In our region, the freeze probabilities are such that, in our judgement, it would be unwise to plant any type that typically ripens past early to middle September (because freezes can come early and fruit come late—Nature doesn’t run on strict timetables), and we omitted such types from the list below; but if you are in a distinctly more moderate climate, you can look at other types. We think, though, that there are still so many fine choices that there is no need to try stretching the season. Another advantage of such a cut is that pretty much every type listed should cross-pollinate every other type (though you should check particulars before making irrevocable choices of types); for example, Pristine, the earliest here, will pollinate Liberty, almost the latest listed. Pristine July 25 Yellow Medium to large Moderately tart Fresh 6 weeks Resistant Very resistant Resistant Moderately resistant Moderately vigorous, spreading, wide crotch angles Excellent for so early a type, but poor keeping ability. Our choices would be one Pristine for early apples and cross-pollination, and a couple of trees of Liberty for the “main” crop for both immediate use and storage (Liberty is said by some to be about the best of all disease-resistant types). If, for simplicity, we assume that the types yield right on nominal schedule, and that their keeping qualities are just as advertised, then about the time the Pristines are done, the Liberty trees will just be yielding. That will keep one in home-grown apples for 7 out of every 12 months. You will, of course, pick your types, and the quantity wanted of each, based on your own tastes and needs. Johnny Appleseed notwithstanding, the normal way of getting an apple tree is to buy it from a nursery. As discussed above, apple trees are typically supplied as the wanted fruiting stem grafted onto a distinct rootstock; the fruiting stem is chosen for the sort of fruit wanted, and the rootstock for the final tree size wanted and for the extant growing conditions. One usually buys trees that are from two to four years old, the tradeoff for age being price and effort neded to plant the new tree. The information below is meant as a summary outline, to give you an idea of the overall approach; it is not meant as detailed, step-by-step instructions. Such detailed instructions are readily available on line from many excellent sources, and often include helpful illustrative images. 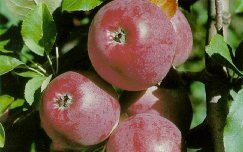 The University of Missouri’s web page Home Fruit Production: Apples is one good example from the many available. Apple trees can be spring-planted or fall-planted. Trees are normally available as “bare root” trees (just what you think it is), and those should be planted out in late March or early April, that is, as soon as the soil can conveniently be worked; don’t be afraid to plant apple trees in cold weather, as long as you can dig the needed hole. Avoid trying to plant trees out when once the air temperature starts to rise from early-spring levels. Nurseries will normally deliver ordered trees only when it is appropriate to plant them, but when it is, be ready for the delivery! One can also buy containerized trees in the autumn for pre-winter planting; that sort should be put in the ground in middle to late October. Apples are not terribly fussy about soil conditions, and will grow in a wide range of pH values and fertility levels. They do, though, require some protection from wind, most especially if they are on a semi-dwarf or dwarf rootstock; the usual approach is to sink an eight-foot support (something strong, such as two- or three-inch aluminum tubing) about two feet into the ground near the tree and tie the tree to it loosely using a soft, thick cord that will not cut into the bark. Never commit the folly of winding a cord, especially a thin one, snugly around the young tree’s trunk, else as it grows it will slice itself severely, essentially being strangled by the cord. Avoid placing apple trees (or, really, any tree) in a “frost pocket”, a low area or depression that will catch and hold cooler air (warm air rises, cool air settles). They need full sun. When you receive your bare-root trees, take great care not to expose the roots either to sun or to drying winds. When the trees arrive, unwrap the package and check that the roots are moist; if they aren’t, attend to that. Keep the roots packed in moist peat moss, sawdust, or strips of newspaper until you are ready to actually put them into the ground. Also keep the roots cool (but above freezing). Try to plant trees as soon as possible after you get them—having the site already prepared and ready to go is a wise idea. Trees not planted out pretty much right away can start to bud out, which leaves them especially vulnerable to breaking. About an hour before actually planting a tree, soak its roots in a bucket of water to assure that they are well hydrated. Before planting the tree, inspect the root system; prune any broken roots, and shorten any long roots down to 12 to 18 inches in length. Use sharp pruning shears (and be cautious—it’s easy to cut yourself badly). The planting hole should be about 2 feet wider than the spread of the tree roots as received, and deep enough to prevent crowding. Tentatively hold the tree in the open hole; if it looks like the roots would be cramped, enlarge the hole; do it once, do it right. As to hole depth: the tree should be planted such that the graft union (where the fruiting stem was spliced to the rootstock—it will be plainly discernable, but look up some photos) is about 2 inches above the final soil line. Never bury the union! Dig the hole a bit deeper than needed, then pile up some loosened soil under the roots. Hold the tree firmly in place (planting is a two-person job) while shoveling the soil back into place. If you know you have voles in your area, or even just think it possible, you really need to protect against them: they can strip a tree’s roots down to a stem nub in no time. What you need is wire mesh (spring for stainless steel rather than the commoner galvanized: voles can actually gnaw through even galvanized-steel mesh) of ¼" mesh, at least 2 and better 4 feet in width (it comes in rolls). You need to bury at least 12 inches, and better 14 inches, of it around the circumference of your planting hole, leaving at least 12 inches above ground. Voles are said to tunnel no deeper than a foot, but we have had them go under 12" buried mesh; meanwhile, you also need above-ground mest to keep them off the bark. Some suggest 4' width with the buried part going down 12" and the bent outward to an outward-facing “shelf” another 12" horizontally. You can do that around your trees, but better is to do it all round your garden area, as voles will attack your vehetables as well, and they go at it day and night all year round. Refill the hole with the same soil that was removed from the hole—refilling the hole with other materials, even “better” soil, will create a most undesirable situation. To avoid air pockets, tamp the soil with your foot as the hole is being filled. After the hole is completely filled in and firmly tamped down, slowly apply 1 or 2 gallons of water to the tree. That will re-hydrate the tree and also help settle the soil around the roots. If the watered soil sinks down below the level of the surrounding soil (that is, forms a mini-crater), pile some more soil on to even it up again. Should that cause the graft union of the tree to sink into the soil, reposition it so it remains 2 inches above the soil level. If the graft union is covered with soil, the scion cultivar will root and the dwarfing habit induced by the rootstock will be lost, a disaster for the grower. After you have planted the tree properly, put a 15- to 18-inch piece of hardware cloth around the trunk of the tree to prevent rabbits, mices, or voles—who love tree bark—from snacking on your new tree. Get the cloth at least a good 4 inches down into the soil, or the l’il buggers will go right under it. But have a care that as the tree grows, the cloth doesn’t start to “girdle” (strangle) the expanding tree trunk. Do not use those white wrap-around spiral tree guards, because ugly and harmful insects find the space between them and the trunk to be bug heaven. Don’t forget to properly stake the new tree. Put the supporting post (a “stake” is inadequate support) to the windward side of the tree, perhaps two feet windward of the trunk. Something like a 2-inch-diameter aluminum pole hammered two or more feet into the ground is the sort of thing you want; it will remain there for the life of the tree. Be careful to secure the tree to the post with something srrong but soft and not thin, so the tree trunk is not roughed up or cut in high winds; some people use torn-up strips of nylon stockings. Also have a care not to loop the tie material around the trunk, lest the tree “choke itself” as the trunk diameter increases with growth. After a new tree is planted, it needs a few years (typically 3 to 5 years for semi-dwarf—though there is often some useable fruit at 2 years—or 4 up to 10 years for a full-size tree) before it will bear nontrivial amounts of fruit. During that period of establishment, careful training of its limbs and careful nipping of buds growing in the wrong places are vital if the tree is to become a sound scaffold capable of supporting its load of fruit. Proper pruning is a subject too long for coverage here: check the web for illustrated expert advice. About a month after an initial spring tree planting, apply about a half pound of 12-12-12 or similar fertilizer to each tree; apply it in a circular band around the edge of the original planting hole. The year after planting, apply about one full pound of the same sort of fertilizer to each tree in a circular band within the drip line (the outline of the tree canopy) just before growth begins in the spring. In following years, fertilizer needs will probably increase; the amount to apply can be estimated by the growth made in the preceding year. Young trees (one to six years old) should have 12 to 18 inches of new growth each year and 6 to 12 inches of growth thereafter. Growth above or below these figures would indicate too much or too little fertilizer (one is as bad as the other). After inspecting the amount of terminal growth, the amount of fertilizer can be adjusted from the amount applied the previous year. In a year when the blossoms are injured by frost and the crop is lost, do not apply any fertilizer because it will promote too much vegetative growth. For fruiting trees, more is not better when it comes to growth: we want fruit, not tree. Apple trees are members of the Rosaceae family , the roses; more particularly, they are “pomes”, a designation that refers to their inner seed structure. A number of other common fruiting trees are also pomes, including the pear as well as the hawthorn, loquat, medlar, quince, rowan, and whitebeam. Apples are what is called “self-incompatible”, meaning that each blossom must be cross-pollinated to develop fruit. Not all cultivars produce sufficient pollen to be acceptable cross-pollinators. The wild ancestor of Malus domestica is Malus sieversii (no common name in English), a native tree of Kazakhstan—indeed, the region where it arose is today called “Alma-Ata”, meaning “father of the apples”. M. sieversii is still found wild in the mountains of Central Asia, from southern Kazakhstan on to Xinjiang in China. It is now believed that a single species, still growing in the Ili Valley on the northern slopes of the Tien Shan mountains at the border of northwest China and the former Soviet Republic of Kazakhstan, was the progenitor of the apples we eat today: DNA taken from trees in that area showed them all to technically belong to M. sieversii but to also have some genetic sequences common to M. domestica. There is now ongoing research aimed at developing infusing M. domestica cultivars infused with the much higher disease resistance of the older species. Because apples can be winter-stored much longer than any other cool-weather tree fruit (the warm-weather citrus fruit also store well), the apple tree has been an important part of food-growing throughout Asia and Europe for thousands of years; it may indeed have been the very first fruit tree to actually be cultivated by humans. The Biblical tradition that Eve tempted Adam with an apple appears to have arisen owing to the similarity of the Latin words malus for apple and malum for evil (and the words are alike in the plural, mala). It was last modified on Friday, 8 February 2019, at 20:33 EST.